Access algorithms have been studied extensively for systems consisting of one base station, shared by a number of terminals. Interference from terminals in other cells is generally neglected. These studies therefore suggest conventional cellular systems, where different cells are allocated different frequencies. 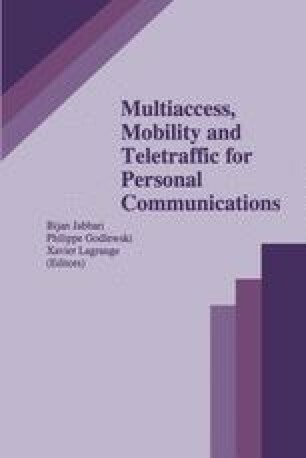 In this paper we will study a system consisting of a number of access ports. All terminals may access any of these ports using a common radio channel. It has been shown that such multi access port systems can obtain much higher throughput compared to conventional cellular systems. We propose two access algorithms. One of the algorithms is based on the principle of the Idle Sense Multiple Access (ISMA) algorithm. The algorithm takes interference from other terminals in consideration and is therefore called Interference Adaptive Multiple Access (IAMA). In the second algorithm first a selection of terminals that can transmit simultaneously is made, after which the selected terminals may transmit their data packets. We name this algorithm Multi Port Auction Aloha (MPAA). We compare the performance of the two algorithms to that of Slotted Aloha. We will show that both algorithms have a much higher throughput than slotted Aloha. The throughput of IAMA is clearly best.